Try this simple beet hummus made from chick peas and beets. It is a very healthy and delicious snack. The color is a great way to entice kids. I am absolutely in love with hummus. If I am making a sandwich, I use it as a base for the recipe. I will use it as a dip or spread it on pita bread. A couple times, I have had it just right out of container. 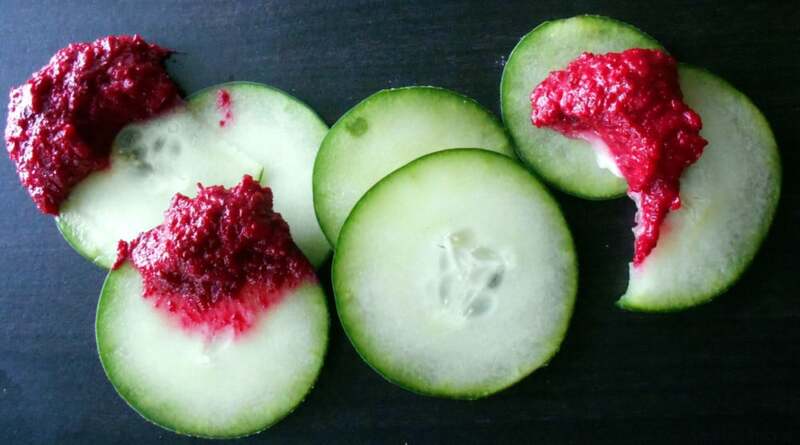 Often, I will have cucumber and hummus as a snack while I am sitting at my desk. It is my favorite thinking food. The color of this beet hummus is what catches your eye. That vibrant bright red is so perfect for the hummus. The one thing you have to be careful is that it will stain any material it lands on. I accidentally dropped a little bit of it on my shirt and the stain was very difficult to remove. 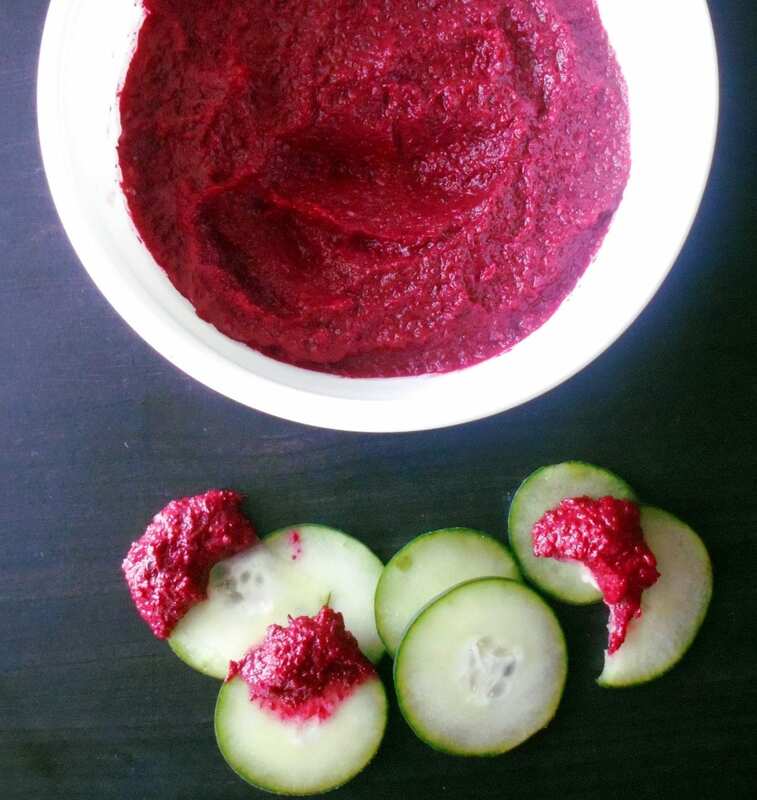 With my Beet-may-stain-but-they-are-very-healthy week in full swing, I decided that a bright red color would be perfect for hummus. That will shake things up in the color department. There is only ONE thing to know about making beet hummus or hummus of any kind. REMOVE THE SKIN FROM THE CHICK PEAS!!! Many hummus recipes don’t make it clear that the skin from the chick peas needs to be removed. If you don’t remove the skin, you end up with a very rough textured beet hummus. I always use canned chick peas to make hummus and continue using it in beet hummus. Canned chick peas have already been soaked and salted. So, they are ready for cooking. Why waste time soaking chick peas overnight! I also have a spicy kale hummus and a parsley hummus recipe that you are going to love. Tell me which one is your favorite! The skin from a canned chick pea comes of easily with a very simple tug of fingers. However, removing skin one chick pea at a time can be very tedious and time consuming. So, make sure you have about 30 minutes per canned chick pea, just for removing the skin. In a strainer, add the chick peas and wash with cold water several times. Drain all the water and place the chick peas on a paper towel. Thank you so much. It makes me happy to hear that. Thanks, Matt!! Please send me pics. I love this recipe. I’ve made hummus before, but never with beets. You can’t “beet” that great color. haha I’ll be trying this one soon. Thanks. That is funny! Love the pun! Thank you for liking my recipe. Thank you for wanting to try it. Your hummus is exquisite and I love that the idea is so unique. Don’t go to clown college unless you plan to have lots of extra time. 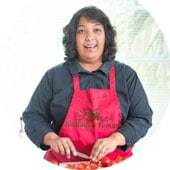 You can’t give up cooking, recipe development, photography and blogging. You’re too good at it. I love hummus! I never thought to make it with beets. I’ll have to give this a go. Funny story about the clowns – we were on our way to the circus for the first time with out daughter many years ago. She was 3 and it was a bit of drive to get there. We noticed she was very quiet and asked her why and she replied “I’m very worried the clowns are going to steal my shoes” hahaha Still makes me laugh. What on earth made her think that?? Love this gorgeous hummus, the color is amazing!!! Thank you, Tara. It is gorgeous and pretty. Just as tasty as it looks.